A celebration that started back in the beginning of November shows no signs of slowing down! 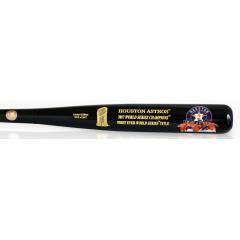 This beautiful, full-size commemorative bat was created to honor the 2017 World Series Champion Houston Astros. The bat features the exclusive art of the very talented Jolene Jessie, as she captured the Astros celebrating the team's first ever World Series Championship.The bat features the exclusive art work of renowned sports artist Jolene Jessie reproduced on each bat. The image shows the fictional art of the following players celebrating the First World Series Championship in the city's history. The players are the World Series MVP George Springer, the AL MVP Jose Altuve, Alex Bregman, Carlos Beltran, Charlie Morton and Brian McCann. Order yours before they are gone, and display it on any wall in your home or office. Due to the limited nature of this offer we must charge your credit card for the full price immediately upon taking your order. This policy ensures we reserve a bat for you. We will confirm your order by Email. This bat is not game used. Please allow 4 to 6 weeks for delivery.